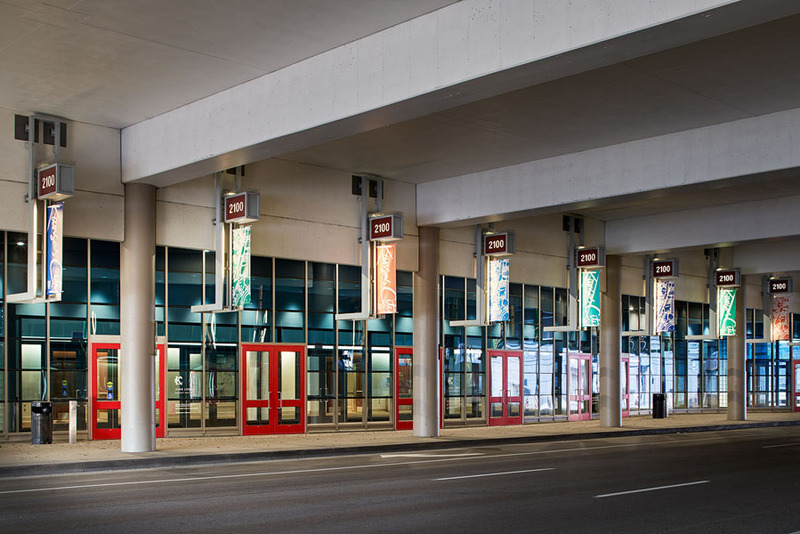 As a part of a large renovation project for the Kansas City Convention Center, Piper-Wind Architects created iconic new main entrances to the Bartle Exhibit Hall along both sides of 13th Street. The undulating walls of the two entrances engage in subtle dialogue across the street, and while modernist in vocabulary, still provide much needed contrast to the geometrically patterned, rectangular volume of the exhibition floor above. 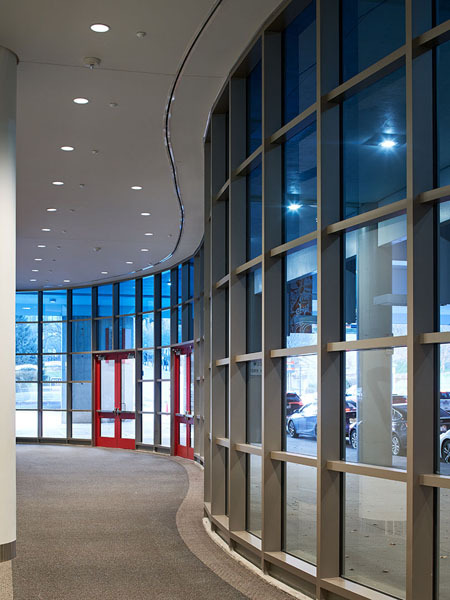 The sinuous colored glass volumes form welcoming interior spaces as well as exterior alcoves along the sidewalks where groups may gather before and after events. 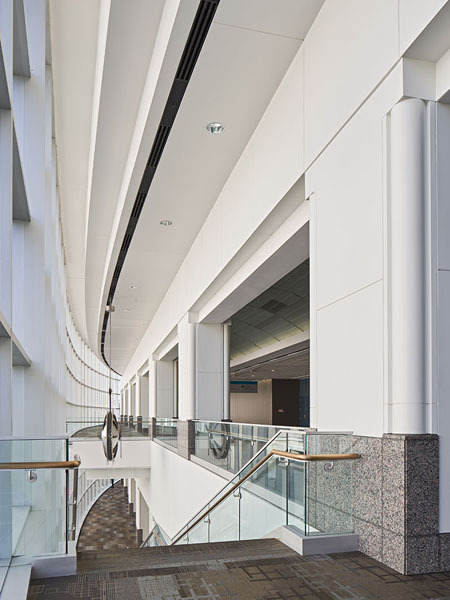 Architectural details, such as linear ceiling diffusers and carpet borders serve to accentuate the curves indoors. 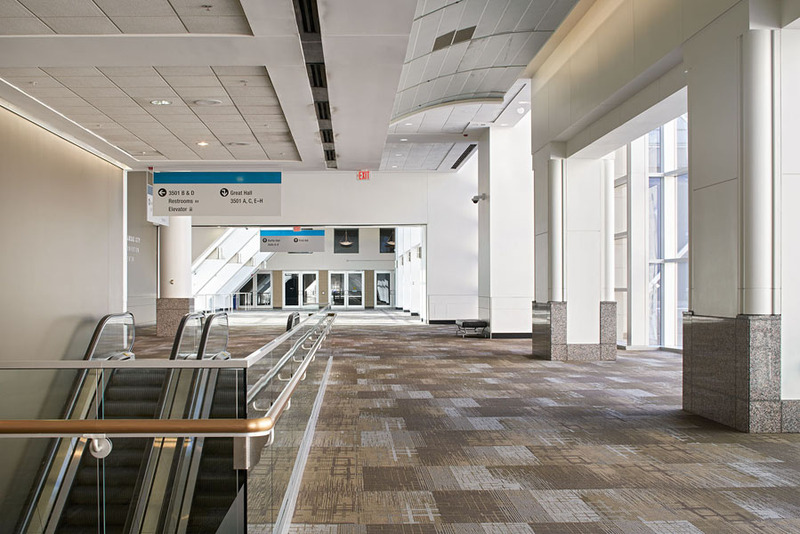 As a transition between indoors and out, the spaces serve to mediate temperature and provide an acoustical buffer to the vehicular traffic continually flowing past. 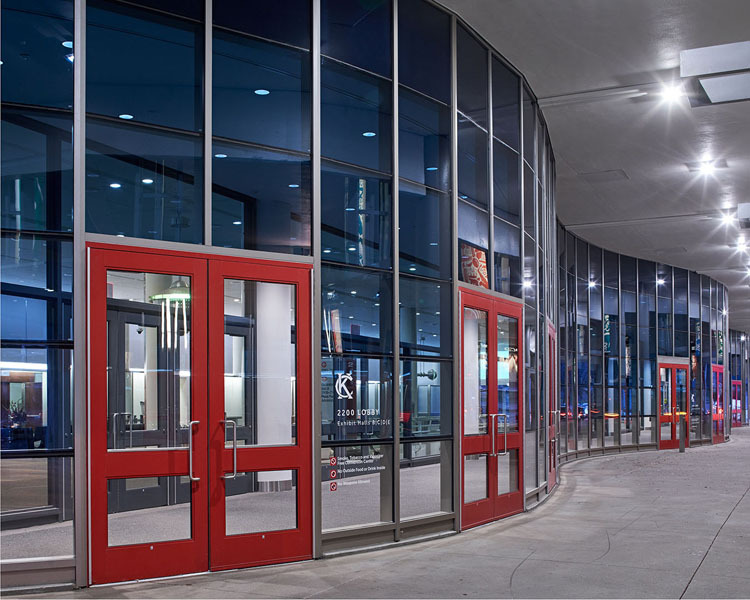 The two-phase project replaced inaccessible, non-ADA compliant revolving doors with wider doors and robust hardware, including multiple automatic doors for ease of access. 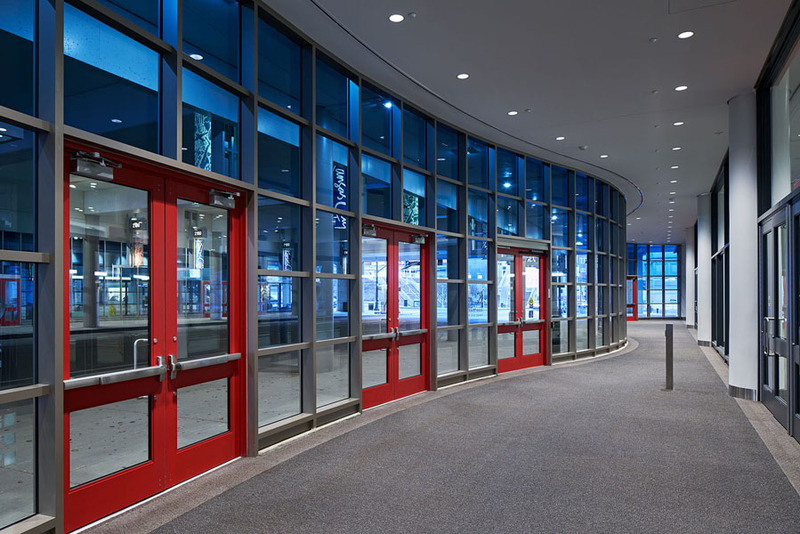 Exterior signage and lighting upgrades also serve to enhance the visibility of the new entrances. 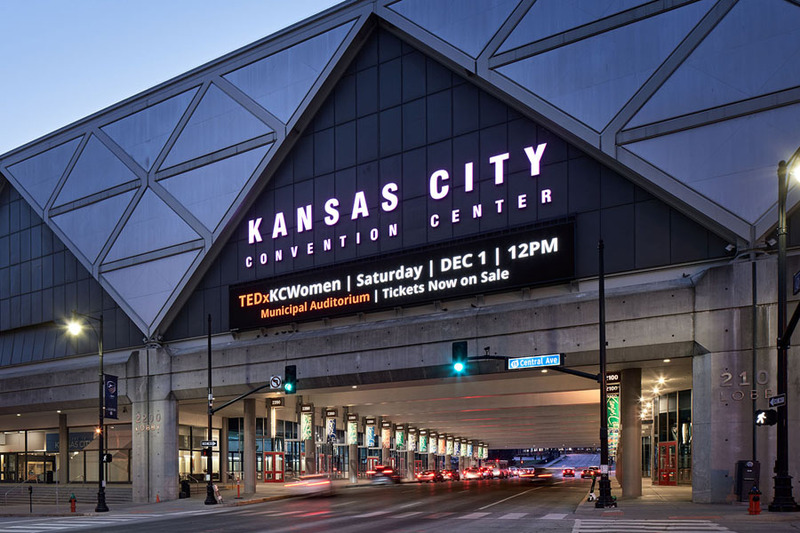 The Conference Center serves to link the Convention Center Exhibit Hall to the Grand Ballroom, and architecturally mediates between the modernist aesthetic of the exhibition hall structure and the art deco style of the Municipal Auditorium across the street. With three levels of meeting rooms and event spaces, supported with generous lobbies and pre-function gathering spaces, and linked with escalators and bridges, this is a very active building. New ADA compliant room identification signage in public lobbies and service corridors supplements existing overhead signage. Renovations also included accessible improvements to drinking fountains, public restrooms, dressing rooms and green rooms. 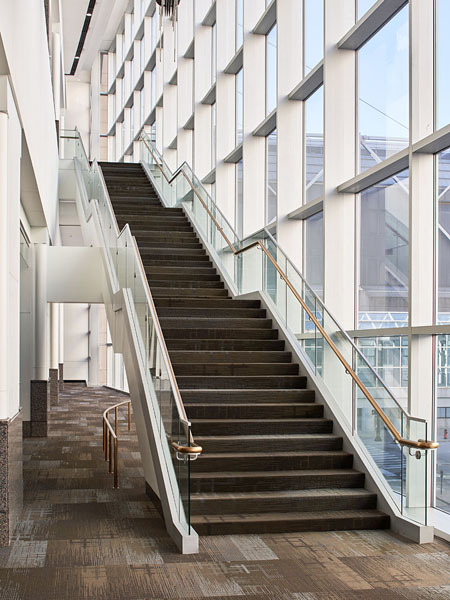 Modifications to handrails and guardrails were also necessary to bring the grand stair and egress stairs into compliance with current ADA and building codes, blending the modifications with the original iconic architectural aesthetic.